Home / HACKING NEWS / Malware / NEWS / Security / The Hacker returns $17 millions worth of stolen Ethereum ! The Hacker returns $17 millions worth of stolen Ethereum ! An Israeli cryptocurrency venture called Coindash was preparing for the Initial Currency Offer (ICO), but as soon as the sale began, a hacker intercepted the company’s website and stole about 43,000 worth of Ethereum. At the time, the stolen cryptocurrency equivalent to the US $ 7.4 million, but today it costs approximately US $ 35 million. The incident took place when hackers breached the CoinDash’s website and replaced the official Ethereum address to a fraudulent Ethereum address. The users then sent ETH to the fraudulent Ethereum address rather than the CoinDash’s official address. It seems the hacker seems to have regretted it and there is a change of heart. Almost a year after the robbery, he returned $ 17 million of stolen Ethereum. In September last year, about 10,000 Ethereum were returned to Coindash from the attacker’s address. Now, last Friday, he returned another 20 thousand Ethereum. 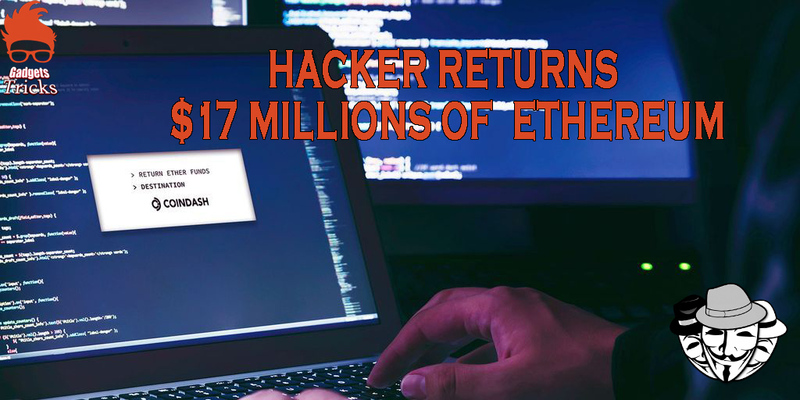 Currently, the hacker still own 13,000 in Ethers stolen of the initial amount, which indicates that they might return more money. In their official blog ,the company confirmed the return of the cryptocoins and claims that it has already informed the authorities including the Counter Cyber Terrorist Unit in Israel. In addition to continuing to track and monitor the hacker’s address in case of any suspicious activity. “Similar to the hack itself, the hacker’s actions will not prevent us from the realizing our vision, CoinDash product launch will take place next week as originally intended,” said Alon Muroch, CoinDash CEO. However,The hacker, whose identity is still unknown, hijacked the site and quickly stole 43,000 ether tokens, CoinDesk reported. The thief still has 13,400 ETH tokens (worth $11.6 million using today's price), which is about one-quarter of the amount he originally snatched.